Gurgaon-based on-demand hyperlocal delivery ShadowFax Technologies Pvt Ltd has acquihired Pickingo for an undisclosed amount, in a cash and stock deal in a bid to ramp up and serve its clients better. First reported by The Economic Times, the acquihiring comes within days of Pickingo stopping its hyperlocal services. Queries sent by Techcircle to both Shadowfax and Pickingo went unanswered at the time of filing this report. Hyperlocal logistics startup Pickingo, run by Gurgaon-based Pickingo Logixpress Pvt Ltd, started operations last December by doing reverse logistics for e-commerce majors Jabong, Snapdeal, Shopclues and Paytm across six cities. It has tie-ups with nearly 300 restaurants, pharmacies and grocery outlets also. The company had 100 employees and 300 field executives, according to a statement released in August 2015 when it raised $1.3 million in funding from venture capital firm Orios Venture Partners and Toppr.com co-founder Zishaan Hayath. A spokesperson for Orios declined to comment. As part of the transaction, Shadowfax has on-boarded around 45 employees from the management team of Pickingo and a considerable number of delivery boys that add up to a few hundreds, according to the ET report. "At Shadowfax, we are trying to develop competency of completing deliveries in 30 minutes to an hour, and this deal will help us achieve our goals faster," said Abhishek Bansal, CEO, Shadowfax. Founded in May 2015 by IIT graduates Abhishek Bansal and Vaibhav Khandelwal, ShadowFax provides restaurants with a technology-driven framework to incorporate features such as automatic rider scheduling, seamless app communication, instant feedback, geo-based tracking, and location-based rider allocation. According to the company’s website, Shadowfax has presence in Delhi-NCR, Gurgaon, Mumbai and Bangalore. Pickingo has been up for grabs for some time now. In September, Restaurant listings and review firm Zomato Media Pvt Ltd, which operates through Zomato announced a minority stake pickup in Pickingo. However, the deal did not go through. With more than 20 startups vying for customers and investor money, the space is ripe for consolidation. In October, hyperlocal grocery and fresh food delivery platform Grofers acqui-hired B2B logistics startup Townrush. Meanwhile, e-commerce biggies Flipkart, Snapdeal and Paytm are also gearing up to enter the hyperlocal delivery space, and once that happens, consolidation will further speed up. Flipkart is reportedly testing its ordering app Nearby in Bangalore to deliver groceries, electronics, clothes and other products. Shadowfax had secured $9 million (Rs 60 crore) in Series A funding in September this year from Eight Roads Ventures, the investment arm of Fidelity International Ltd.
Queries sent to Eight Roads Ventures elicited no response. In August, it had raised around Rs 1.90 crore ($300,000) in angel funding from Snapdeal’s co-founders Kunal Bahl and Rohit Bansal, Powai Lake Ventures' Zishaan Hayath and Limeroad co-founder Prashant Malik. Other startups in this sector too are raising funds. In October, hyperlocal delivery startup Roadrunnr was in talks to raise a fresh round of funding from existing backers Sequoia Capital and Nexus Venture Partners besides other new investors. In July, Roadrunnr, had raised $11 million in Series A funding from venture capital firm Blume Ventures, besides Sequoia Capital, Nexus Ventures and others in July. Russian billionaire Yuri Milner also put money in Roadrunnr. 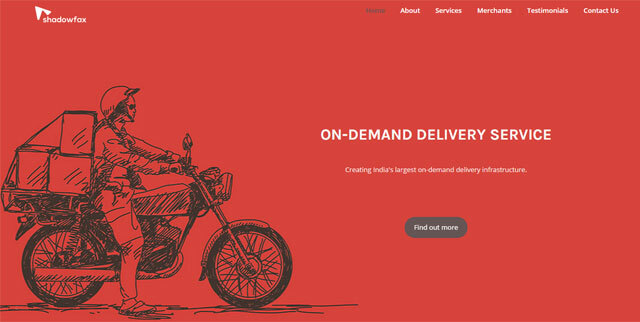 Around the same time, Bangalore-based hyperlocal delivery startup Opinio raised $7 million in Series A funding led by e-commerce logistics firm Delhivery. In July, Opinio raised nearly $1.6 million from Accel Partners. On-demand shipping services startup Parcelled.in raised $5 million (about Rs 32 crore) in a fresh round of funding led by logistics services company Delhivery with participation from data analytics firm Tracxn.